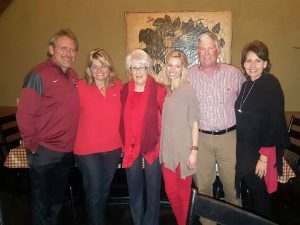 Pictured from left are Marty Burlsworth, Vickie Burlsworth, Barbara Burlsworth, Katie Ryburn, Randy Strickland and Julie Strickland. We have become friends, and their love for us has certainly helped give us the confidence to continue Craig’s legacy through the Craig Strickland Foundation. Apostle Paul’s description in Phillipians 2:2-4 of how he taught the Phillipians to live with each other reminds our family of the Burlsworth family.